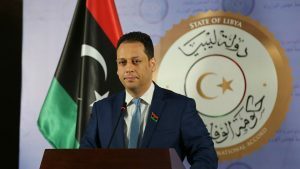 Mohamed El-Sallak, the spokesperson for the head of the Presidential Council (PC), Faiez Serraj, said that discussions were still ongoing with regards to the delayed 2018 budget (Financial Arrangements). Speaking at today’s regular weekly press conference, Sallak explained that there was coordination between the Finance Committee of the House of Representatives, the Central Bank of Libya and other stakeholders to complete the financial arrangements for 2018. He added that the PC Ministry of Finance had confirmed that the January and February payroll for all government sectors had been transferred to the CBL since 14/3/2018, in accordance with the National ID Number system. When pressed by members of the media for more details on the proposed 2018 budget, Sallak declined to make any revelations.